Tripp Lite's TLP810NET surge suppressor has 8 outlets, a 10-ft. cord with a space-saving right-angle plug, and diagnostic LEDs. The unit has a surge suppression rating of 3240 joules to handle the strongest surges. Built-in RJ11, RJ45, and Type F coax jacks prevent surges from damaging your modem/fax/10BT/cable/satellite equipment. Coaxial jacks provide digital broadband quality and can handle 2.2GHz bandwidth. $250,000 Ultimate Lifetime Insurance (USA & Canada only). It works great...good company! Not much else to say other than it's simplicity and does the job I want it to. This was purchased to supply surge protection for the TV setup I did in my home office. TV, cable box, PS3 and network switch all hooked up with ample spare room. I like the way they give the 3 positions space in case you have larger transformers. Got this surge protector by putting an alert into techbargains.com. Protector works beautifully, the price was ridiculously low and it came in the mail in no time. House was hit by lightning. The fire department responded. Lots of damage. The big screen TV still works two months later. I now own four of these surge protectors. Has one of the highest surge protection ratings. Comes with 6 ft. of coaxial, phone, and ethernet cable. Love how on one side, the outlets are spaced apart for large plugs. Also like how they have slide covers for each outlet for safety and to keep them clean. Sorry for the long review but I felt that it required all of the information. I do not typically write reviews on products, but in the case of this TrippLite Surge Protector; I felt as though I needed to share my story. I like the wide outlet spacing. Great for thansformers. All is good except the "ethernet" connection that is a telephone adapter. It does not work for my ethernet that connects to my modem, the reason for this purchase. Will need a seperate connector now. This is why a "4" instead of a 5 star rating. I'm mainly posting this review to clear up some misinformation that appears to be given. First off I work in IT mostly with computer networking, and I also have a degree in computer networking so I'd hope I could get this right. This rating is closest to what a DVR I have suggested. Time will tell if the surge works like it's rated to work. I Tripp Lite "FANTASTIC" , Great & Quality Item, a Must for Electronics of All Types, Got another many years old & Its Still Working hard to Protect My Electronics ,Found I Needed yet ANOTHER & THis Item DOES THE DUTY !!! This protector gives me the necessary configuration of outlets to protect my AV equipment. The number of joules protection is adequate. Recently I have had equipment damaged due to cable lines being struck by lightning. I spent extra money for this surge protector so I can protect my cable line. My internet was having trouble after hooking up the free coax cable it came with and connecting it to this protector. Still working after buying in 2010. I have never had any problems with it and would buy again if I needed more. Only issue is the Ethernet pass through is not gigabit so I don't use that port. Ive had surges and recently a tree fell on the power lines sending 220 through the whole house! This protector not only saved the equipment, but still had some functionality afterwards !!!!! I now own about 4 of them ! Gives you some piece of mind. The following is a review of my Tripp Lite's TLP810NET surge suppressor. It has 8 outlets, a 10-ft. cord with a space-saving right-angle plug, and diagnostic LEDs. The unit has a surge suppression rating of 3690 joules to handle the strongest surges. Hands down the best out there! So far so good! Had no problems plugging in! Had no vampire surges yet, that's why I only gave it 4 stars. This is a very good surge strip and when you consider that the price is (was) under $40 it's a great value. If you're looking for high end surge suppression and willing to pay $200+ you can find better but this surge strip specs out comparable to anything I could find $150 and under. Just got it. No issues. No storms or surges that would test it. I do like the reputation Tripp Lite has. Peace of mind for so little money. Great product. I chose this model for the joules of surge protection and how thin it was, though I only needed one socket. The ones that plug onto the outlet would cover the buttons for the ARC socket protector I have. I velcroed this to the back of a wall mounted 40" Samsung TV. First one I bought last September for my computer setup works perfectly. The second one I ordered last November also appeared to be fine but when I recently went to use an outlet that I had not used before, I could not insert a cord (out of alignment). This unit allows me to put all my computer cords in one place, including using two of the three transformer outlets. I could plug in one more if I had the need, or even two more if I leave one regular outlet open. I cannot comment on the technical details because I have not had occasion to know. Read reviews, liked feedback, bought item everything worked except the 3 three prong plugs. It was a clearance item so i get what i pay for but suggest items be tested before being resold. Or i forgot, price was much cheaper also. Well, I can't get all technical but I can say that I believe this is the best surge protector on the market for the money. It offers a great amount of line inputs, my main point of interest is for the coax protector. I'm a little disappointed in this. My refrigerator interferes with my TV reception through the antenna amplifier, and I hoped this would solve the problem. It doesn't. Otherwise, it's a very good power strip. It's exactly what I wanted form my two sets of TV and related equipment. The cable in/out protection and supplied cable was nice. Lighting is now less likely to blast that stuff. And in our area, summers come with lightning. Very good product. No issues. This item has been in use for a few months . It works very well. Get it. You want this one for your TV and internet because of the ultra high and honest Joules rating. And, trip light is the best surge protector not built into the main circuit board for your house. I've never had one malfunction over many years now. Lightening hit a tree next to his house and a fork jumped to his roof (blew a bunch of shingles off). It ruined his TV, phone, a couple of radios and a bunch of lights. Ruined the surge protector too but it did its job, his computer was fine. 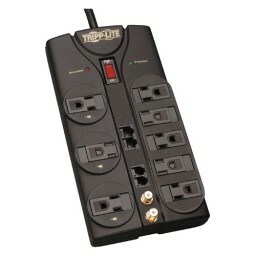 Tripp Lite replaced the surge protector for free. Well considering nothing has gotten fried yet, let's assume it's doing it's job shall we? Very simple & straight forward hook up. LED lights indicating a grounded & protected circuit are handy as is the conveniently located position of the master on/off switch. Summary ... it's all good. This surge protector from Tipp Lite is great for everyday use. The build quality feels very sturdy and the material is very strong. The right angle wall plug is very convenient for tight spaces. The cap for the plugs helps keep kids safe and keeps dust from falling in. Appears to be a good value - until protection is actually required. Product useless against power spikes or electrical strikes. TrippLite will not honor warranty when your equipment gets fried - so beware. It's a fully loaded surge protector and filter. Unfortunately there is no isolation of its filter function from the line it is plugged into. All X-10 signals (120 KHz) disappear on the circuit it is fed by instead of only downstream from the unit. Really good product. Ordered surge protector one evening received it two days later. Great protection and super price. Just what I needed for my bedroom electronics. The angled plug allows for close placement of furniture to the wall. I now have great surge protection for my HDTV, DVR, DVD and audio equipment. I was so impressed with the first one I bought after I installed it that I ordered two more to protect some additional electronic equipment. The price was right! Having just lost some equipment to a nearby lightning strike I decided to protect my new electronics with a good surge protector that protects everything including the coaxial TV cable. This item does it all and was priced right! Price was right, had all the features I needed. The ethernet cord was a real plus. Like the set up for the usually hard to plug in Transformer plugs. I neede a surge suppressor and a power strip for a classroom. The only outlet on the wall was too far for a standard powerstrip. So, I picked up one of these bad boys. A little more expensive, but I got a 15' cord. Now I can easily reach the wall plug.